CCP aims to serve families in the community who have a need for our programs. Our demographics typically mirror that of the school district. We are financed by the California Department of Education to serve this community. The eligibility and enrollment process is outlined below. We also accept 4C's subsidies. Please contact the main office for more information. Each family interested in applying for subsidized services must fill out a program eligibility application to begin the enrollment process. Applications may be picked up at the Coastside Children’s Programs main office, located at Hatch Elementary School, please contact Mei Clark, mei@coastsidechildren.org. Once the application is complete, parent/guardian can return the application for processing. An eligibility rank will be assigned to the family based on income and family size reported on the application. Families will be contacted based on the identified priorities and ranking from California Department of Education, Title V Child Development Division regulations to verify income and family size when a space is available. At the time when a family submits an eligibility form, priority will be identified and/ or a ranking number will be issued based on the parent/guardian’s initial reporting of their family size and gross income (income before taxes). Based on the initial reporting of family size and income Families will be enrolled based on priority and/or the lowest ranking first until all spaces are filled. When 2 or more families have the same ranking number, program staff will contact the family with the lowest income within the ranking number first. CCP maintains an eligibility wait list when spaces are filled. Families will be contacted based on the ranking number issued at the time the wait list form was submitted. If income and/or family size changed after the wait list form submission, please contact the CCP to update your information. Based on the change(s) reported, the program staff will update the ranking number as needed. Families will be contacted as soon as spaces become available. The parent is responsible for providing documentation of the family’s total countable income and CCP is required to verify the information. The parent(s/guardians(s)) shall document total countable income for all individuals counted in the family size. CCP will calculate income based on income information reflecting the family’s current and on-going income. Family is homeless - when the basis of eligibility stated on the application for services is homelessness, the family data file shall include documentation of homelessness. The documentation of homelessness shall include, a written referral from an emergency shelter or other legal, medical or social services agency, or a written parental declaration that the family is homeless and a statement describing the family’s current living situation. Upon establishing initial eligibility or ongoing eligibility for services, a family shall be considered to meet all eligibility and need requirements for those services for no less than 24 months, before having their eligibility or need recertified, and shall not be required to report changes to income or other changes for at least 24 months. The exception to the 24-month certification is when a parent’s Need criteria is “Seeking Employment”. Seeking employment will be certified for no less than 12-months. A recertification will occur to determine the family’s eligibility for continual services. Total countable income means all income of the individuals counted in the family size. If documentation of income is not possible, you may provide a self-certification of income. Upon establishing initial eligibility or ongoing eligibility for services, a family shall be considered to meet all eligibility and need requirement for those services for no less than 24 months before having their eligibility and need recertified. The family shall not be required to report changes to income or other changes for the 24-months. Each adult counted in the family size must have a need for child care services. If it is determined by the enrollment specialist that there is no documented need for subsidized child care, a Notice of Action to deny or terminating services will be issued. The following are the categories of documentable need for child care. 1. At Risk of Abuse or Neglect - When the basis of need is At Risk of Abuse or Neglect, a child who has been identified by a legally qualified professional in a legal, medical, social services agency, or emergency shelter as being at risk of abuse, neglect, or exploitation, and referred for child care and development services. At-risk families may receive a 24-month fee exemption when a legally qualified professional from a legal, medical, social services agency, or emergency shelter specifies in the referral that it is necessary to waive the family fee. For families with a fee exemption, income information will not be required and fees will not be assessed or collected. If the referral from the legally qualified professional from a legal, medical, social services agency or emergency shelter does not waive the fee, income information must be obtained from the family. Fees must be assessed and collected, as applicable, based on the most recent fee schedule issued by the CDE, CDD. Fee assessment and collection will begin on the first day of enrollment unless the fee is waived. 2. Child Protective Services (CPS) - When the basis of need is CPS, a written referral from a legal, medical, social service agency, or emergency shelter is required. The written referral from shall include a statement that the child is at risk of abuse or neglect and that the child care services are needed to reduce or eliminate that risk. CPS shall certify that the child is receiving protective services and that child care is a necessary part of CPS plan. Note: A “legal qualified profession” means a person licensed under applicable law and regulation of State of California to perform legal, medical, health or social services for the general public. CPS families may receive a 24-month fee exemption when a legally qualified professional from a legal, medical, social services agency, or emergency shelter specifies in the referral that it is necessary to waive the family fee. 3. Employment - When the basis for need is employment, means of verification may include but is not limited to: Pay Stubs, Record of Wages, Proof of Self-Employment, and/or Tax Returns, as well as completed Employment Verification Form. 5. Seeking employment - When the basis for need is seeking employment, participant may be approved to seek employment for not less than 12 months, working days, and for no more than 32.5 hours per week. 6. Seeking permanent housing for family stability – When the basis of need is seeking permanent housing, participant may be approved to seek permanent housing for no more than 32.5 hours per week for consecutive working days, Monday to Friday. 7. Incapacity - When the basis of need is Incapacity, child care and development services shall be based on the documentation provided by the legally qualified health professional which shall include; a statement that the participant is incapacitated and incapable of providing care and supervision for the child. The documentation must identify the extent to which the participant is incapable of providing care and supervision. 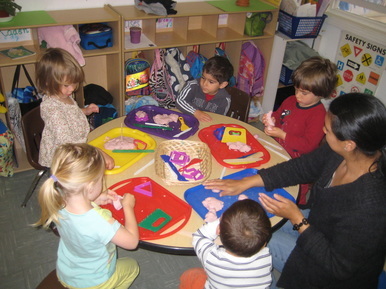 Child care cannot exceed 50 hours per week. Financial aid is centralized at our Administrative offices, but you can find out more about our programs through on-site tours with each center's Site Supervisor.